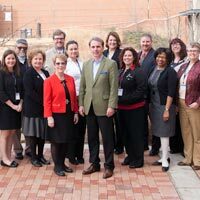 Each year's GLA cohort combines diverse faculty and staff from across the Webster global network. The 2015 cohort of Global Leadership Academy (GLA) fellows returned to St. Louis for their final week of this Webster faculty and staff leadership development program. In the morning, the fellows were joined by President Elizabeth (Beth) J. Stroble and Provost Julian Schuster for a conversation addressing questions of leadership, the meaning of global, strategies for being resilient in tough times, and why the president and provost are excited about the future of Webster University. Michael Cottam, associate vice president for Online Learning, and Michelle Loyet, manager of Online Learning Administration & Student Services, presented “Leading in Online Learning.” They shared the Higher Learning Commission Quality Initiative that the Online Learning Center is focused on and led the fellows through an activity based on the book, “Ten Faces of Innovation,” to consider their role in teams. After lunch, the fellows welcomed Julie Weissman, director, and Justin Bitner, assistant director, of the Office of Institutional Effectiveness. Weissman and Bitner presented “Understanding and Using Data Effectively,” helping the fellows understand how Webster captures data, what the data means, and ultimately how to ask good questions when there is a data need. In the late afternoon the fellows broke into their project teams to spend the afternoon and evening preparing for their team presentations later in the week. On Tuesday, the fellows will hear from deans Eric Rothenbuhler, School of Communications, and Brenda Fyfe, School of Education, before heading out to Webster's Scott Air Force Base location in Illinois to get a better understanding of Webster's services for military populations. In addition to communicating online throughout the year, the 2015 cohort previously gathered in St. Louis in March, and in Vienna in June.